Overweight... AND OVER IT! : Get Behind Me, Satan! I love this verse. It's become one of many mottos I refer to in my weight loss journey. The devil is always trying to keep us from doing anything good that would make us feel more fulfilled in life, getting us closer to God and our dreams. The more we realize this and understand that the devil CAN'T make us do anything we don't want to do, the more successful we can be! Surround yourself with positivity! Believe you can do this! Believe God will get you over this mountain and the next! 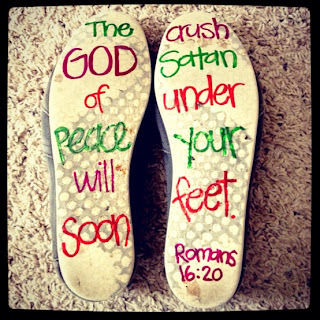 Tell the devil where to go when he tries to make you stumble! And let your hater be your motivator! YAY!!! That's so exciting! Thanks, Michelle! I'll head your way and check out your blog, too!!! !